My friends, read this article carefully. From personal experience, I can verify that a genuine populist message works with a broad spectrum of Tacoma voters, and I am confident would clean up in our county. Bernie is leading the way, and we should follow to take back the county council, the state legislature, and our nation. Very insightful article, shows that deep chord has been struck, and that a real people's democratic, egalitarian, justice and fairness movement can be built in our country...that it is being built,,,and who knows where it will go. Also shows that once again in our history, when a socialist movement is in tune with the pulse of the people, advances far-reaching democratic reforms, that yes, a democratic socialist movement can have deep roots. The genie is out of the bottle. Eric Foner's epistle to Bernie Sanders hits the proverbial nail on the head in urging Sanders to employ in his explanation of 21st century socialism the history of American radicalism. He can start with Thomas Paine's "Agrarian Justice," which sought to level the playing field for young adults, as well as reduce the ravages of age for seniors. The rest is . . . well, history. I disagree with Eric Foner. Eric thinks that today "socialism" means "to rein in the excesses of capitalism." I think it is critical that in talking about America's future, Americans once again become comfortable both with the word "socialism" and with its meaning: ownership of the means of production by workers and communities, including, when appropriate, the national government. The oddest thing: I love Eric Foner's work and (like him) admire the way the Bernie campaign has brought a progressive program and democratic socialism to the current political debate. But I think Eric is wrong to suggest, as he does here, that placing the Bernie campaign in the historic setting of American radicalism is enough. Many of us don't know much about history and such a strategy locks out those who have only the haziest idea who Tom Paine, Fred Douglass or William Lloyd Garrison are. Even more important, none of them had state power. Show me someplace this stuff works. Maybe Denmark is not as a good standard for Democratic Socialism as you'd like but the idea of referring to a working government and country is not wrong per se. Thanks to Eric for the "open letter," to The Nation Magazine for publishing it and to Portside for the link. This is an important source of homegrown ( we can give Tom Paine an honorary American birthright) populism that Bernie should tap in the future. Frederick Douglas is indeed someone he should cite instead of melancholic Danish socialists. I thought this is good. It would be very exciting to hear about the American radical tradition in mainstream media! "How Bernie Sanders Should Talk About Democratic Socialism" (and letter to Bernie Sanders) is terrific on HISTORY but nearly omits our current (2000-2015) greatest problem -- the problem of control of government by big-money. This is not just about unequal shares of money -- it is about absolutely unequal shares of influence on government (at every level). Money buys political favors (Will Rogers said it long ago, but i is truer now: We have the best Congress money can buy). This is NOT just about reversing "Citizens United" although that is important -- it is about getting all entities other than American citizens (human!) out of the business of doing or purchasing (especially from political action organizations) political action of any kind, including lobbying as well as electoral spending, and putting a limit on any citizen's annual cumulative purchases of political action. After all, big-money in politics when it comes in huge amounts from a very few people is merely a megaphone for speech, not "more" speech. And certainly not more wisdom or more democracy. A $5000 annual cap on political spending per-capita would deal nicely with the Koch brothers and others like them. Labor-- keeps making poor choices. And they wonder why their membership declines. A fairly comprehensive analysis before the outcome of the elections in Argentina. Re: The Propaganda Precursor to "The Act of Killing"
This is a wonderful film which exorcises the mythology surrounding what occurred in 1965. One of the prime U.S. actors in formulating the strategy of mass killing was the ambassador to Indonesia, Howard Jones, who was later made head of the East-West Center in Honolulu (where as a student I ran into to him the following year). A real contrast to the chickens I see running around here in Vietnam and I get to eat later! Williams delivered a message of social justice to young children in vibrant color. Her books were music to the ear and soul when read aloud. Not only did she win two Caldecott Awards but, no surprise, she also won two Jane Addams Children's Book Awards for Music, Music for Everyone (1984) and for Amber was Brave, Essie was Smart (2001). She made our children more empathetic. We need more authors and illustrators like her, and publishers like Greenwillow Books. I love her books! Read them to the children! A Progressive Song To Tap Your Feet To! No turning back! we're working for a better world! Can you also spread the word about that, please? Only in New York, Nov. 4, DC, Nov. 7 and Bay Area Nov 13 and more. 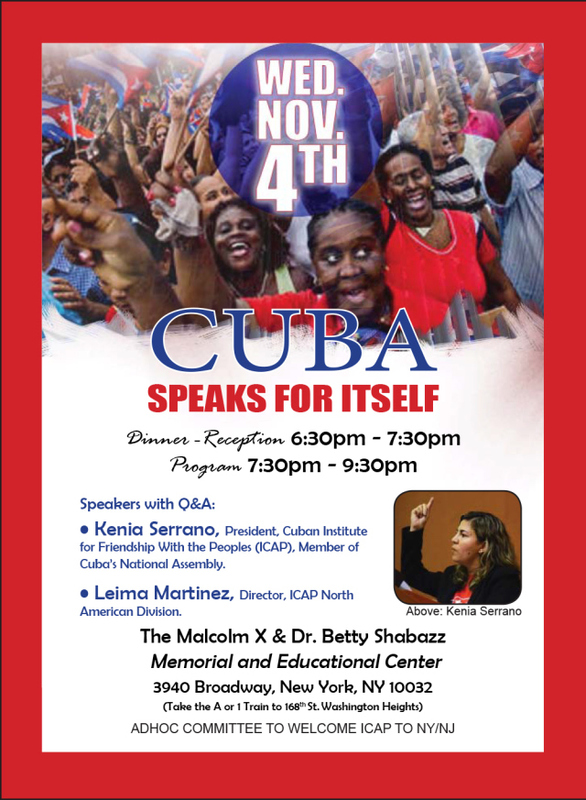 Hear Cuba's voice from this parliamentarian of Cuba's National Assembly and leader of the Cuban Institute for Friendship with the Peoples. George Houser, a leader in the racial justice, anti-war, and African liberation struggles, died this August at age 99. His distinguished yet largely-unheralded life and legacy will be honored at a public memorial service of remembrance and celebration this November in New York City. A committed pacifist who nevertheless collaborated closely with leaders of violent revolutionary movements, Houser played a critical role in the early years of the U.S. civil rights struggle, global solidarity movement with African liberation struggles, and cutting-edge early initiatives of the Fellowship of Reconciliation, the nation's oldest interfaith peace and justice organization. He was cofounder in 1942 of the Congress of Racial Equality, and founding director of the American Committee on Africa in 1955. The service will be held in the James Memorial Chapel of the seminary that Houser attended 75 years ago. The program will include tributes by family, friends, colleagues, and admirers as well as musical selections, in homage to the spirit of a human who loved to laugh and play his harmonica as much as to seriously organize and strategize for a just and peaceful world.